The Background: Silicone-treated release papers are commonplace. Consumers will recognize these products as the paper that gets left behind when we peel off printed labels, self-adhesive stamps and even personal care items. Contamination can significantly affect the product’s performance, product safety, and aesthetics. The Problem: A manufacturer of silicone-treated paper release liner for a personal care article needed to know whether it was responsible for the dark specks attached to a strip of release paper and the adjacent disposable fabric used to contain a personal care article. The Analysis: Both the paper strip and adjacent fabric contained parts of an insect that resembled the common housefly. The more important issue was not what it was, but when it was introduced. The majority of the insect lay on the paper surface and a few parts were loosely attached to the nonwoven fabric pouch. This alone suggested that it may have been introduced when the paper and nonwoven fabric were assembled. However, closer inspection revealed that its legs were covered with fiber strands that proved to be paper fibers. The Conclusion: The paper fibers overlying the insect’s legs indicated that the insect arrived during the paper-making process. 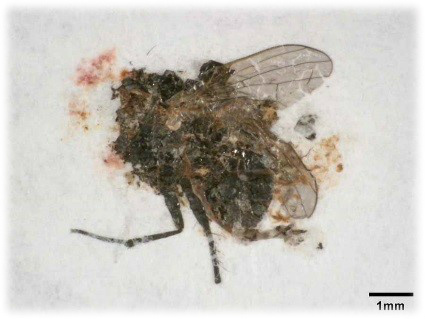 The insect likely landed on the paper when it had a high water content, causing the legs to become entangled with the pulp fibers while the body remained floating. The Outcome: Several entities are involved in the manufacturing of the article, including the papermaker, the silicone coater, the fabric pouch manufacturer and the personal care product manufacturer. In this case, the responsible party was the papermaker. Although the analysis may seem rudimentary, using only a dissecting microscope, knowledge of the processes and attention to detail demonstrate that the scientific professionals at SGS-IPS Testing are capable of offering problem solving on a wide array of materials and processes.